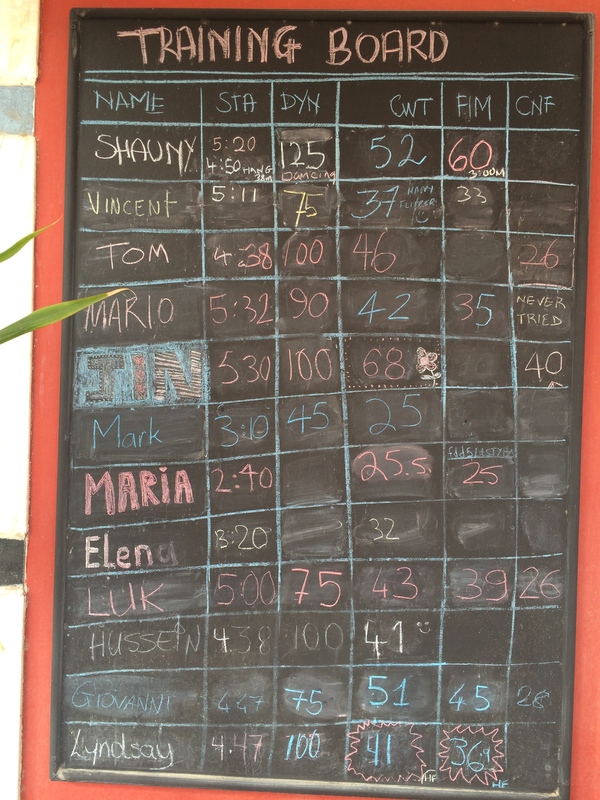 The training board at Freedive Dahab, the biggest freediving shop in the world. The first column lists times for static (not moving) breath holds in water. The second column lists the distances, in meters, that people can swim horizontally in shallow water. The third is the most famous discipline, vertical diving under your own ability. Perhaps more than anything, I have been amazed by the power of freediving to unite diverse peoples. Here in Dahab, Egypt, I train alongside folks from across the globe. My country list so far includes: Croatia, Belarus, Poland, Germany, Italy, Holland, the United Kingdom, South Africa, Ukraine, Egypt, Russia, and Korea. And these folks represent a wide range of social groups, from white collar to blue, students to professionals, and rich to middle-income.Yet at no point do I feel that there is a division between us. Even the apparent gender divide (about 80% of the shop divers are men) disappears when you see that Freedive Dahab, the biggest freediving shop in the world (with sister shops in Thailand and S. Africa) is entirely owned and operated by two very talented and savvy women. In spite of all the ways we might differ, the sport of freediving is imbued with a welcoming and genuine spirit of camaraderie. Similarly, I find it fascinating how ‘flat’ the global freediving community is. Here current and former world record holders are talked about by their first names – e.g., “William”, “Sara” – and pros might train right alongside complete novices like myself. Just take a look at the picture of Freedive Dahab’s training board above to see the range in abilities. Part of the reason for this fairly level ‘training field’ between professionals and amateurs is that the freediving community is small. Freedive Dahab is clearly the biggest dive shop in the world, and yet currently boasts no more than perhaps 15 freedivers in training. But far more important, I believe, is the fact that freediving is inherently a humbling and grounding experience. What do I mean? Well, consider that every diver faces his or her mortality when they dive down, and every diver, no matter how good they may be, depends on the good grace and support of other divers for their safety and improvement. These truths cannot help but remind us that we are all one people with the same basic desires – to live, to breath, to overcome our fears – and that no matter how how much we train, none of us can go it alone. The sport of freediving has a lot more to teach us than how to hold our breathes underwater.